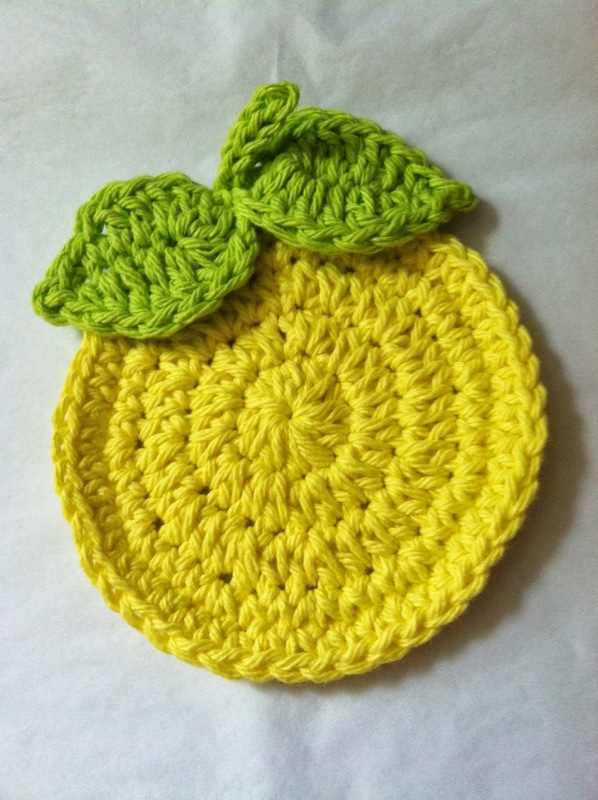 Lakeview Cottage Kids: Having So Much Fun Making Citrus Crochet Coasters..."Lemons" FREE Coaster Pattern!!! 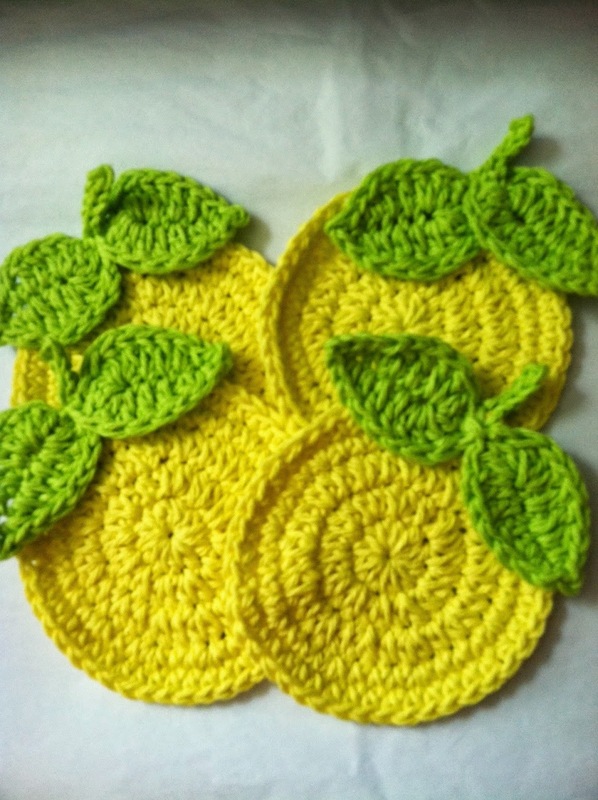 Having So Much Fun Making Citrus Crochet Coasters..."Lemons" FREE Coaster Pattern!!! I am so excited to use these for my next party! 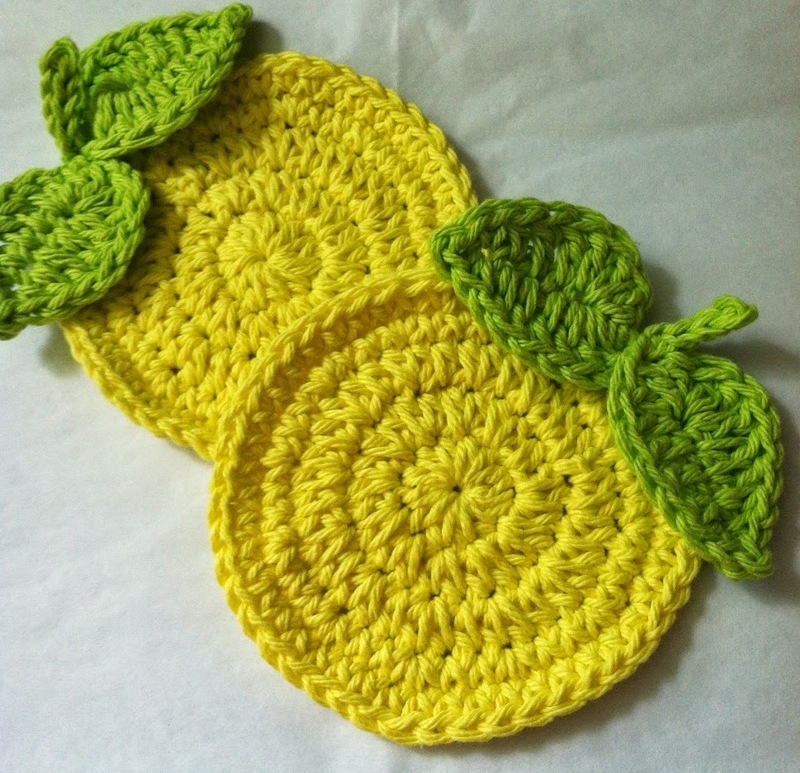 These lemon and orange coasters are so bright and cheery!!! Here is the pattern! It is very much like my Crochet Apple Coaster with a few changes! Round 3: Ch 1. Work 1 hdc in same stitch as Ch 1. *Work 1 hdc in next stitch. Work 2 hdc in next stitch. * Repeat from * to * around. Join to first hdc with slip stitch. Round 4: Ch 1. Work 1 single crochet in same stitch as Ch 1. *Work 1 sc in next 2 stitches. Work 2 sc in next stitch. * Repeat from * to * around. Join to first sc with slip stitch. Round 5: Ch 1. Sc in each stitch around. Leaf: (Make 2 for each Lemon -- 8 Total) Using (Color B) Lime Green. Ch 8. Work 3 dc in 4th ch from hook. Work 1 dc in next 2 chains. Work 1 hdc in next ch. Work 1 sc in next ch. Sl st, ch 1, sl st in last chain. Turn back. Sc in next ch. Hdc in next ch. 1 dc in next 2 dc. 3 dc in final ch. Fasten off and weave in ends. Stem: Using (Color B) Lime Green, attach yarn to end of each leaf and through the lemon. Ch 5. Turn and sl st in next 4 st. Sl st in first st on the actual lemon. Fasten off and weave in ends. Try making some as Oranges, too! These look so pretty on the summer table!!! These look so delicious I can't wait to try making them! Thank you for sharing! 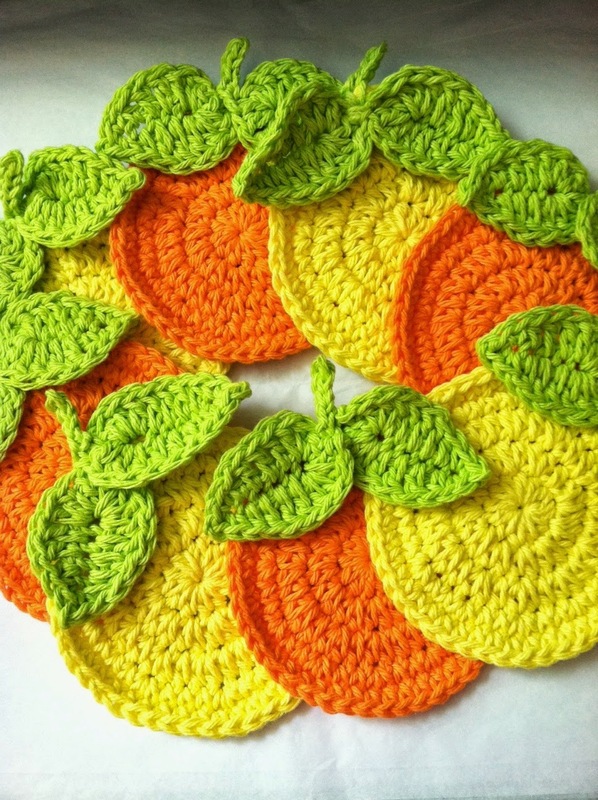 FREE Pattern for "Oranges" Crochet Coaster Set!!! Crochet Beach Bag Is All Done! New Free Pattern Coming Soon! Crochet Beach Bag!